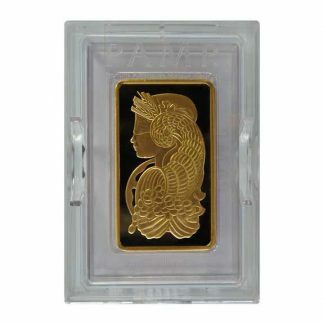 The Perth Mint has an outstanding reputation for fine gold coins and bars among investors and collectors worldwide and the Perth Gold Bar 10 oz is no exception. Founded in 1899 as a colonial branch of Britain’s 1,000 year old Royal Mint to make sovereigns from Western Australian gold, it was acquired by the State Government of Western Australia in 1970. Subsequently, The Perth Mint was appointed by the Commonwealth Government as the sole producer of Australian gold, silver, and platinum investment coins. 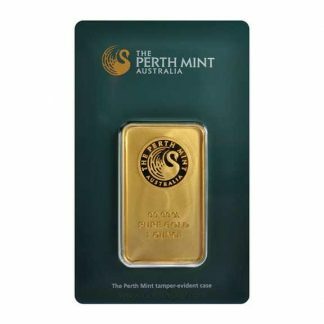 When investing in the precious metals by weight, the Perth Mint Gold Bar 10 oz is also difficult to beat for value and liquidity. 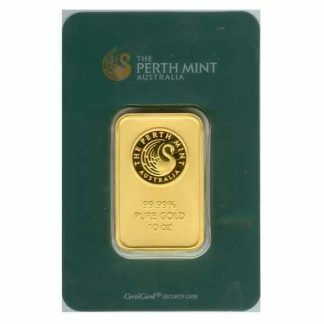 The Perth Gold Bar 10 oz comes in Perth Mint tamper-evident green plastic case which is easy to identify: the front features the Perth Mint Australia trademark which is also imprinted into the 10 oz gold bar. 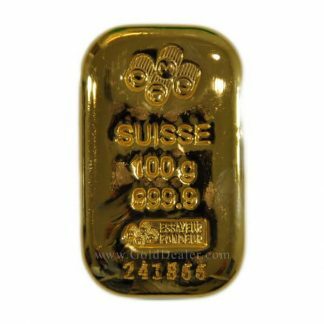 The bar itself is struck with squared edges and a frosted surface featuring brilliant highlights and marked as to purity (99.99%) and content (Pure Gold Ten Ounce). The reverse packaging features a 7 place identification number and specifications including content and fineness. 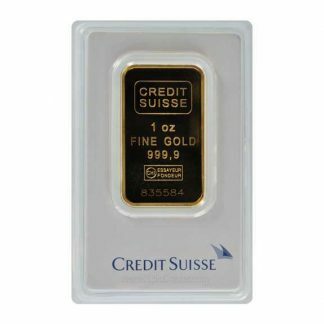 From the sole producer of the Australian Government’s gold and silver bullion program come these superb Minted Gold Bars; wholly trustworthy, and cost-effective, they are an excellent way of adding gold to any investment portfolio. 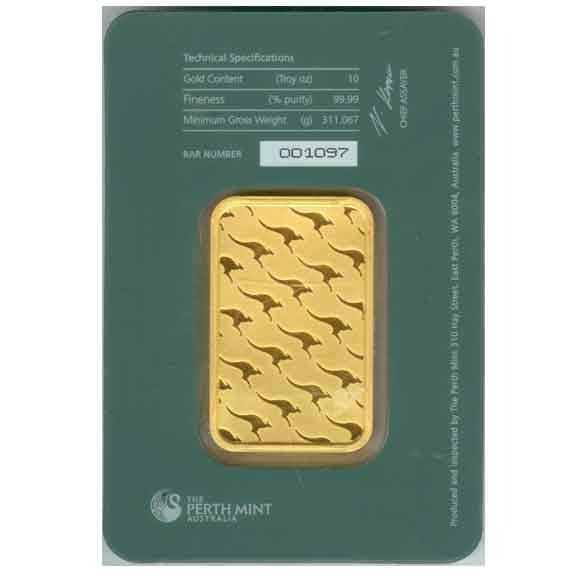 Each minted Perth Gold Bar 10 oz bears the distinctive symbol of Australia’s golden heritage, including the Mint’s famous majestic swan on the face. The reverse of each bar is decorated with wallpapered silhouettes of kangaroos, a native species of the Australian Outback where gold has been mined commercially since1851. The series is available in a choice of weights ranging from 5 grams to 10 ounces; Perth Mint Gold Bars are meticulously struck from 99.99% pure gold. The Perth Gold Bar 10 oz is individually sealed in a tamper-proof presentation card featuring a unique serial number and the signature of the Mint’s Chief Assayer. 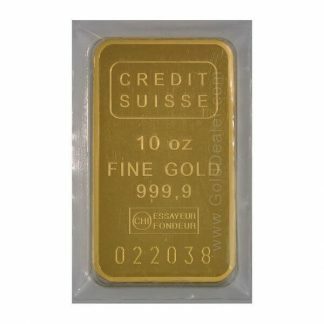 There are other reasons to own this bullion standard: (1) the premium over gold content on the Perth Gold Bar 10 oz is small and attractive to investors looking for a bullion product which fluctuates daily with the worldwide price of gold. (2) Because the Perth Gold Bar 10 oz is produced by a renowned refiner its content and purity is accepted worldwide. This allows traders to post daily buy and sell prices which assures liquidity. (3) Because the Perth Gold Bar 10 oz is pure it appeals to a worldwide audience including the Chinese and Asian trade another plus for marketability. (4) The Perth Gold Bar 10 oz size is small enough to be convenient and also provides choices when buying or selling a larger gold bullion position. (5) Finally there is no reporting requirement (Federal Form 1099B) for this popular gold bullion bar when you purchase or sell keeping paperwork to a minimum.